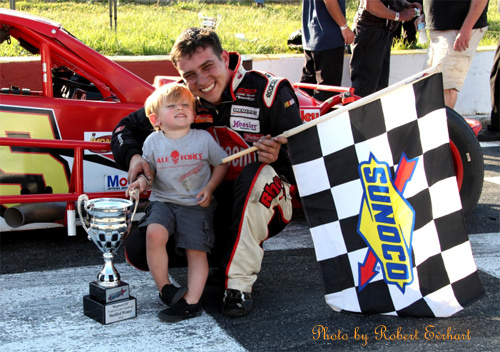 (Callaway, VA): Cale Gale drove his “Lightning McQueen” look-a-like number 95 to the win today at Franklin County Speedway in Callaway, Virginia. Gale took over the lead after a battle with James Civali in the Hillbilly Racing #79 on lap 91 and led the rest of the way. Busch Pole winner, Jason Myers, led the first 63 laps before a suspension part on his ride broke bringing out the first caution. Burt Myers led one lap before contact between Myers and Civali ended the day for the #1 car. Gale took over for eight laps before Civali charged back to the point for 19 circuits. Civali had a tire go down and pitted handing the lead over to Gale for good. Jason Myers recovered to finish second followed by Jason Tutterow and Mike Norman. Richard Thomas was the highest finishing “Mod Lite” in fifth followed by Jerry Scott, Don Johnson, Civali, Burt Myers and “Mod Lite” “Busch Fast Qualifier”, Drew Moffitt rounded out the top ten. The next event for the Southern Modified Race Tour is May 20th at Kingsport Speedway in Kingsport, TN.